Mariusz Błaszczak, the Minister of National Defense, has decided to purchase an additional four training aircraft M-346 Bielik for the Polish Armed Forces. Thanks to this, the Polish Air Force will operate 16 M-346 aircraft by the end of October 2022. Poland will be the second country, after Italy, with the largest number of this type of aircraft in the world. 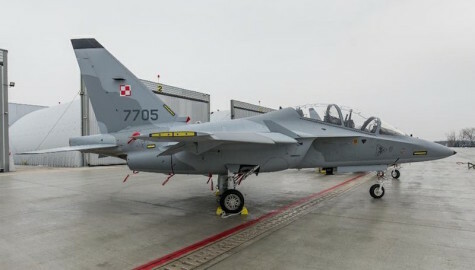 In addition to deliveries of four additional M-346 aircraft, Leonardo S.p.A. will also provide to the 41th Air Aviation Base additional elements included in the logistics package, and will also modernize the "own-foreign" system (IFF) to the latest NATO standard STANAG 4193 Edition 3 in all Bielik aircraft owned by the Polish Air Force. Poland, when deciding the purchase of new aircraft, took advantage of the right of option contained in the original contract for the supply of the Integrated Advanced Training System (AJT). The first eight M-346 aircraft together with the training and logistics package included in the Integrated Training System - Advanced Jet Trainer went to the 41th Aviation School Base in Dęblin as a result of an agreement concluded on February 27, 2014 between the Armament Inspectorate and Alenia Aermacchi SpA (currently Leonardo S.p.A.). The value of this contract amounted to PLN 1,436,014,762 (334,3 million euros) gross. Pursuant to the agreement concluded on March 27, 2018, additional four M-346 aircraft were purchased along with the logistics package and seven Simulation Based Training positions increasing the functionality of the pilot training system with the deadline for completion by the end of October 2020. The next four aircraft were planned, just launched, the Right of Option. Leonardo S.p.A. committed to deliver them by the end of October 2022. The total value of the contract from 2018 is PLN 1 275 387 880.68 gross, of which PLN 599,999,998.71 is the basic order, and the cost of the elements provided for by the Option Right is PLN 675,387,811.97.